On June 22nd, 2004, in the city of Monterrey, Nuevo León, Mexico, Gov. Perry had the honor of signing the Agreement for Regional Progress with his counterparts, the governors of Tamaulipas, Nuevo León and Coahuila. Given that the administration of Chihuahua was coming to an end, the Governors decided to wait until the new Governor of Chihuahua was sworn into office to incorporate the state of Chihuahua into the Agreement. On October 21st, 2004, in the City of El Paso, Texas, an addendum to the Agreement for Regional Progress was signed, incorporating the Mexican State of Chihuahua as signatory to this important Agreement. Texas and the four Mexican Northeastern states have made history by partnering together as a result of the Agreement for Regional Progress, and will join efforts to create new jobs and expand economic opportunities along the border. The five states are united as never before by common interests and open dialogue, and are determined to seize the opportunity to achieve unprecedented bilateral cooperation. Through this Agreement, Texas renews its commitment to always seek common ground, to maintain an open dialogue, and to work with one another to build a better tomorrow for all the people of Texas and Mexico. 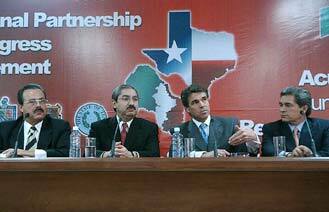 Governor Perry with his Mexican counterparts speaks in Monterrey, on June 22, 2004, about the importance of the Agreement for Regional Progress prior to signing the document. 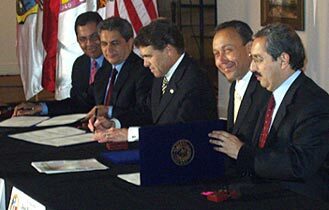 Governor Perry signs the Addendum to include Chihuahua in the Agreement for Regional Progress in El Paso, on October 21, 2004.